Timbertots were contacted by Eglinton Primary School in January 2011, the school already had a fabulous play trail which Timbertots had installed the previous year but the school’s PTA had been fund raising over the years and they now wanted to develop a very large grass area for Key Stage 1 pupils complete with seating and planter. David had an initial meeting with the Key Stage 1 teacher in January 2011 to discuss their requirements and establish the brief. Eglinton Primary School wanted to create and outdoor learning area for Key Stage 1 pupils to incorporate physical/active play, water play, imaginative/role play and also music/arts. Whilst doing this it was also important to the school to keep the area grassed and retain the natural look. 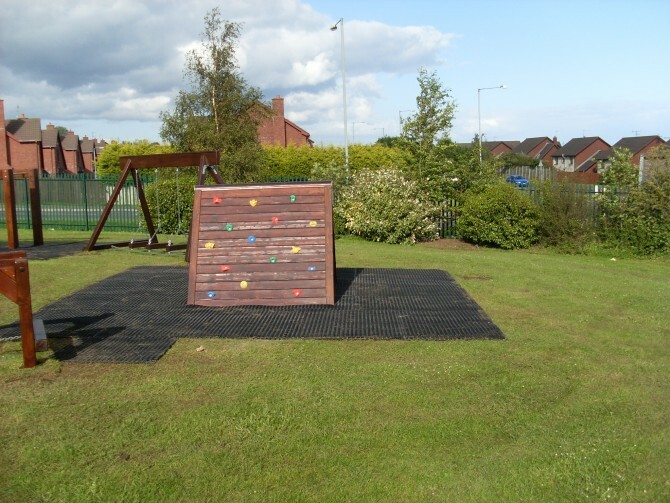 The site had drainage issues which would need to be addressed prior to the installation of the equipment to ensure that the maximum benefit could be gained from the new play area. After establishing the requirements of the school David designed an exciting combination of Timbertots products to meet the needs to of the school. The resulting design was drawn up using Autocad and a colourful layout plan and competitive, all costs included, quotation was sent to the school. Further meetings with the school identified the need to reduce the cost of the project. David therefore redesigned and combined several of the musical items into one triangular unit allowing the school to keep all the equipment they had wanted whilst delivering the project under budget. Work on site commenced in July 2011 and was fully completed by August 2011. The poor draining on site was overcome in an innovative way by layering up a slight mound of sand to give excellent drainage around the central climber unit where foot traffic is expected to be highest. This was turfed and then laid with rubber lawn mat safety surfacing to create a dry safe space which retains the natural look of grass. 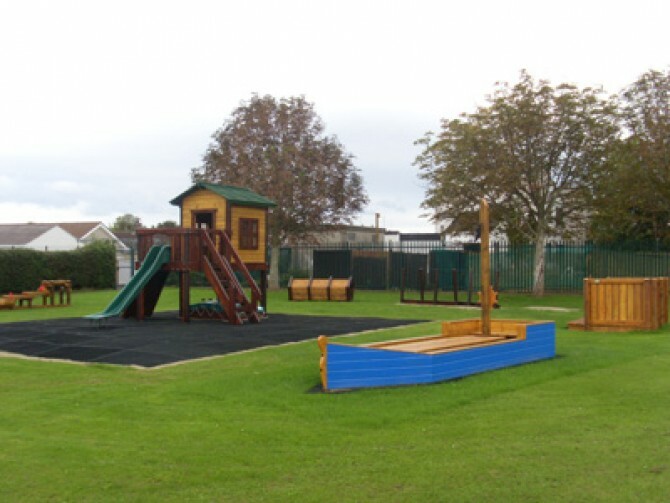 “Our equipment from Timbertots has taken an under used grass area and given all pupils from Year 1-7 the opportunity to participate in very different play experiences – both planned/formal and informal. The Key Stage 2 ‘Trim Trail’ has also added benefits of health and exercise.